By now, everyone knows well about my obsession for Instant Pot. I don’t easily fall for anything unless I get the true value out of it. Before owning an IP, I debated if I already have a pressure cooker, rice cooker and a slow cooker, what difference would IP make. It could be just another appliance that will take up space on my kitchen counter top. However, after owning and cooking in an IP for the past few months, I can only say that it made all the difference in terms of cooking time, taste and being efficient. Hands down, the best kitchen appliance that actually resolves some of our issues. Hats off and much gratitude to Robert Wang- the man behind the Instant Pot. Making Chicken biryani in the IP had been on my top to do list ever since I got the IP. Finally, that happened and let me tell you this is the best testing biryani- much much flavorful and made without much effort. All I had to do was marinate the chicken, soak the rice and saute the onions till caramelized. Chicken was pressure cooked for 5 minutes and then rice was added to the cooked chicken and pressure cooked for another 5 more minutes. 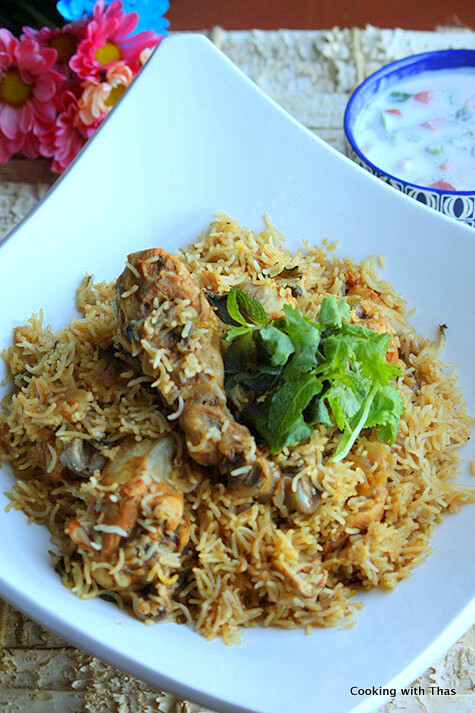 Delicious chicken biryani was ready in no time. 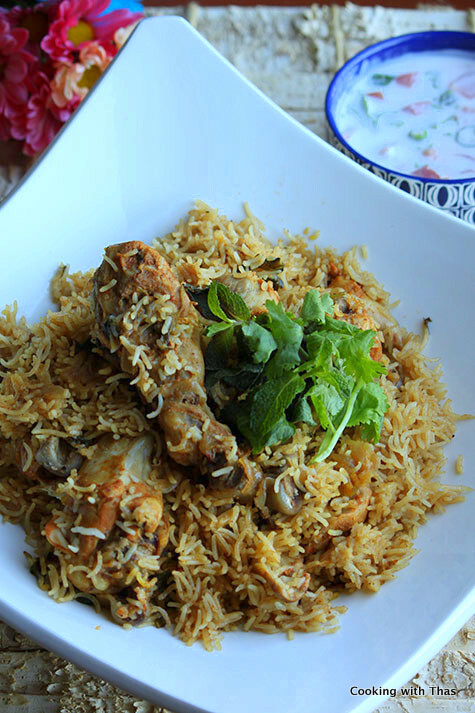 Caramelized onions and the rice cooked in the chicken broth that’s left after cooking chicken along with some more water really enhanced the flavor of this biryani. In a large bowl, combine the chicken along with the above mentioned ingredients 'to marinate chicken'. Combine well and let marinate for 30 minutes. Click Saute Mode (More)- let hot sign be displayed. Just before you start sautéing the onion, soak the basmati rice in 2 cups water for 20 minutes. Add ghee, and add bay leaves and whole cardamom to the ghee, saute for 2 seconds. Add onions, season with ¼ tsp salt. Saute for a few minutes till onions turn translucent. Add ginger- garlic paste and saute onions till they turn brown- takes about 15 minutes. It's important that onions turn brown- enhances the taste of the biryani. Click cancel to turn off saute mode. Close the pot with the lid. Turn the knob to sealing and click Manual: high pressure, set time to 5 minutes.. Walk away. It will take 5 minutes for the pressure to build and 5 minutes to pressure cook. After the beep, turn the knob to venting and do a quick pressure release. Pressure will be released completely in a minute. Open the lid, there will be around 1 cup of chicken broth left in the pot. Now, drain the rice in a strainer and slightly rinse under running water. Add 2 cups of rice and add 1 cup regular water (for 2 cups basmati rice 2 cups liquid is required). Add ½ tsp salt, 1 tbsp ghee (optional), mint leaves and chopped cilantro. Combine well. Add 2 pinches saffron soaked in 1 tbsp water, combine well. After the beep, do a quick pressure release (QPR). Open the lid, fluff using a fork. If you prefer, you could garnish with roasted cashew nuts and raisins. Serve along with raita, pickle, pappad etc. It's finger linking delish!!! 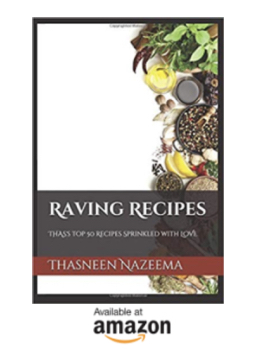 If using 3 cups basmati rice: add 2¼ cups water. 1 cup chicken broth will be in the pot after cooking chicken.